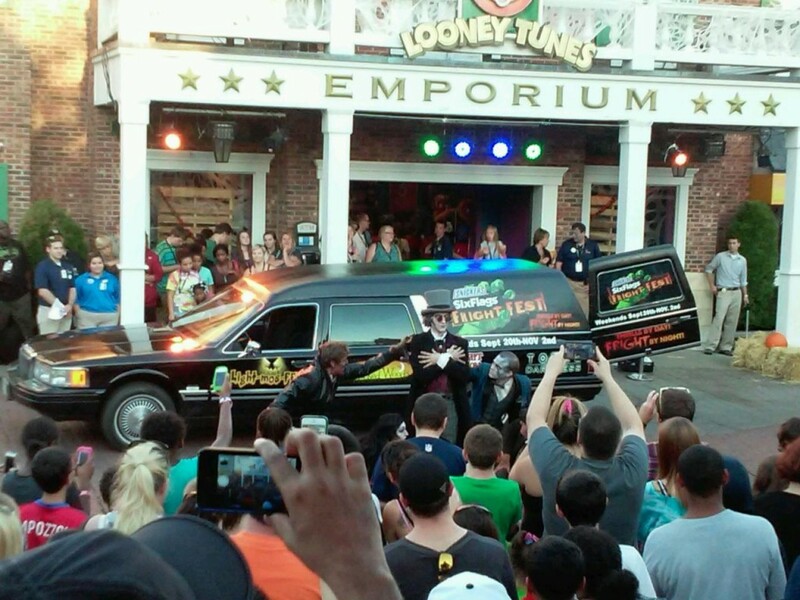 On Saturday, September 27, we were invited to Fright Fest media day. 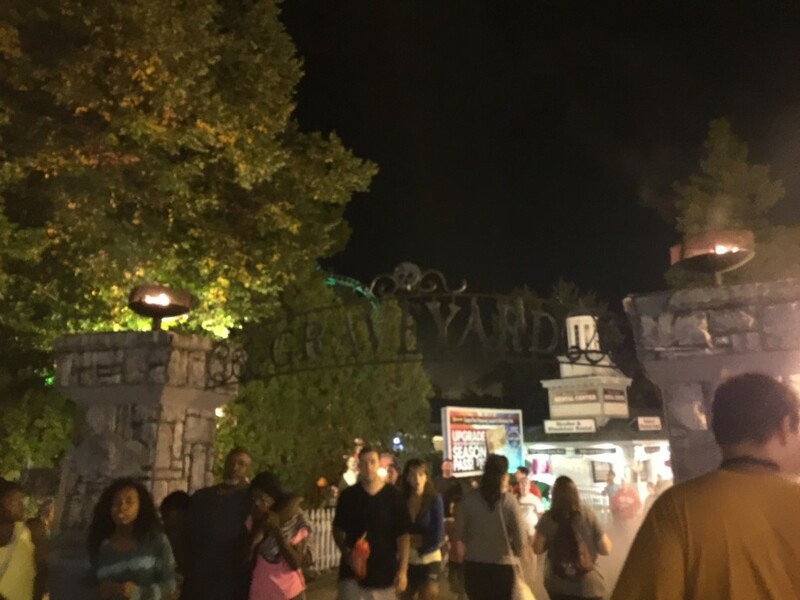 This is our Six Flags New England Fright Fest review. Check-in for the event was at 3:30. Much to our surprise, we were put into groups for a VIP (or VIZ) tour of the park. This was a huge shock. No one in the group had ever experienced something like this before. 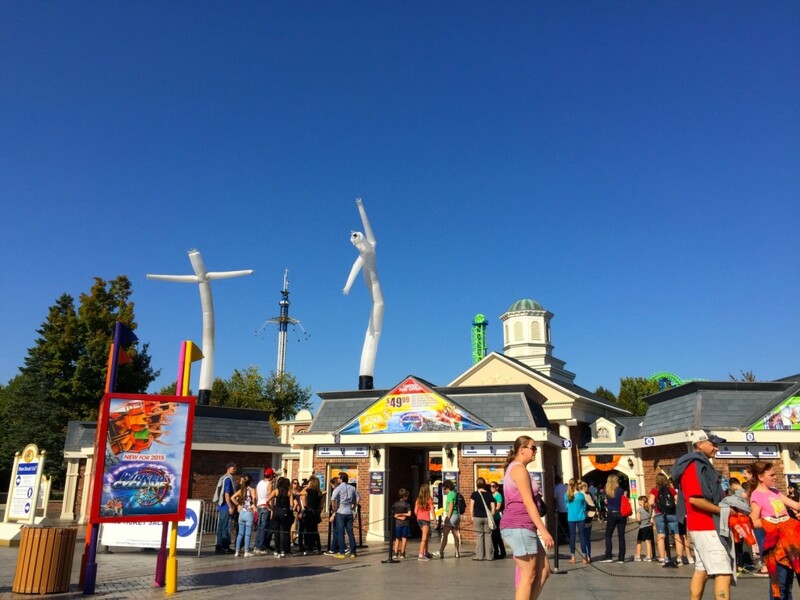 As many of you know, Six Flags has Thrills by Day and Fright by Night. 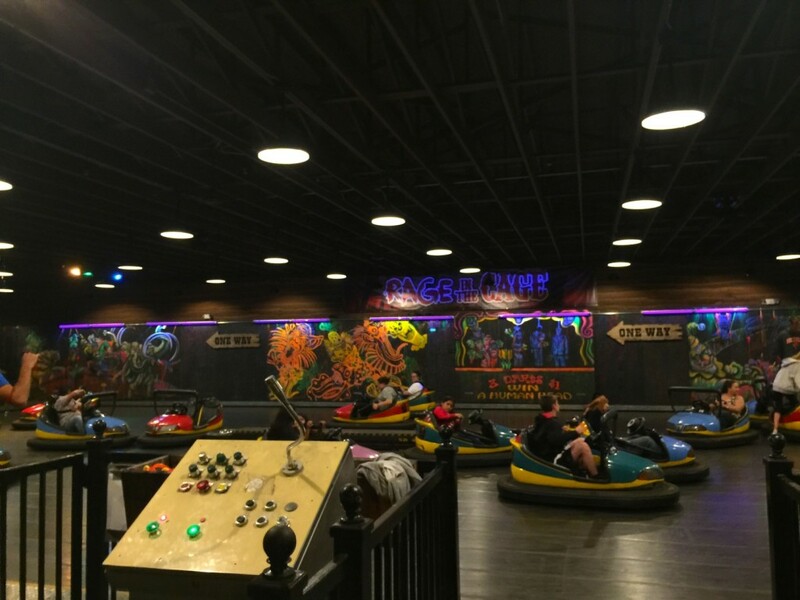 Here is what people can experience during Thrills by Day. 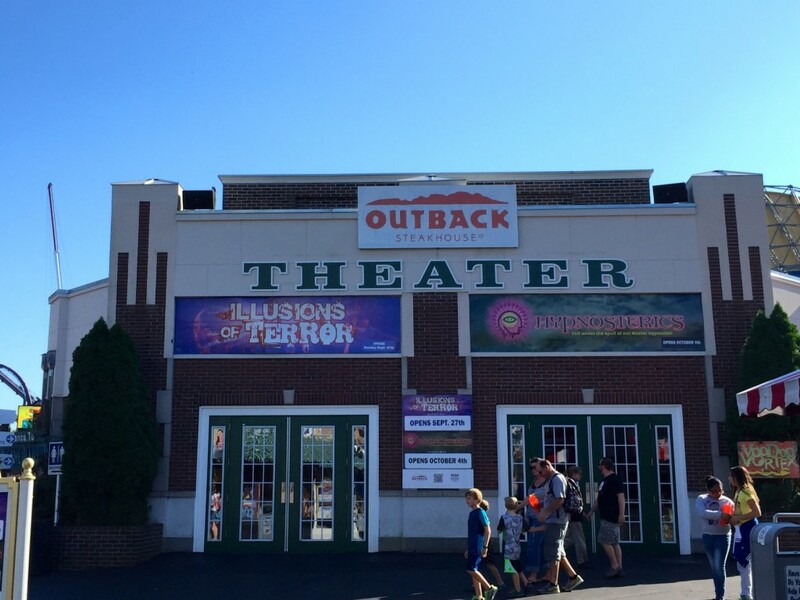 David Garrity and the hypnotist are back in the Rockville Outback Steakhouse Theater this year. Since we didn’t do either show, we were treated to something very special: a free ride on Slingshot! This was the first time anyone of us has ridden it since Bizarro’s media day in 2009. What a rush! I forgot just how thrilling a Slingshot ride could be. After this, we got VIP access to Batman and Splash Water Falls. We took the VIP opportunity to do rides that we haven’t been able to ride in a while due the long waits they tend to gather. As with Slingshot, it had been a while since anyone had ridden Splash Water Falls. It wasn’t as fun as I had remembered (didn’t it have pads in the flume that would spin the raft like crazy?) and no one got wet. 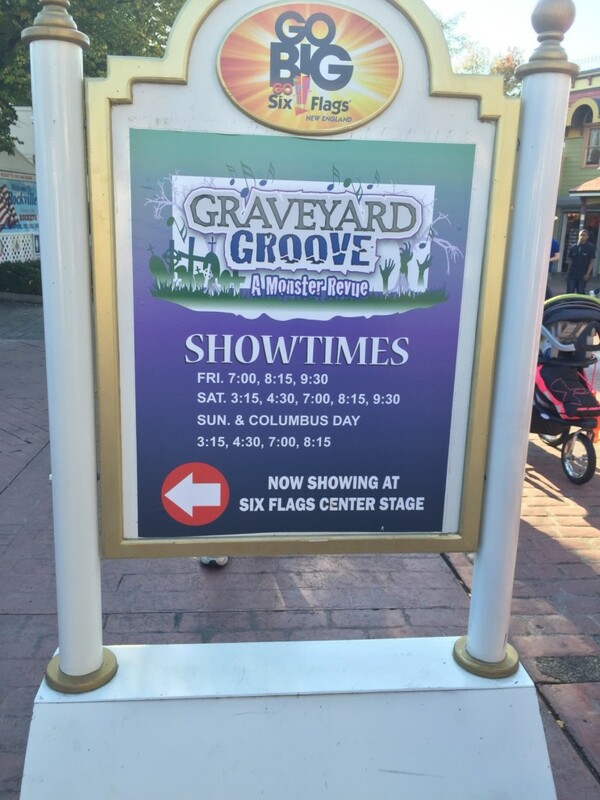 After this, we decided to check out the new show on Six Flags Center Stage (formerly Kidzopolis Center Stage) called Graveyard Groove: A Monster Revue. This show was pretty decent. I do think that changing the stage from Kidzopolis Center Stage into just Six Flags Center Stage was a good idea. 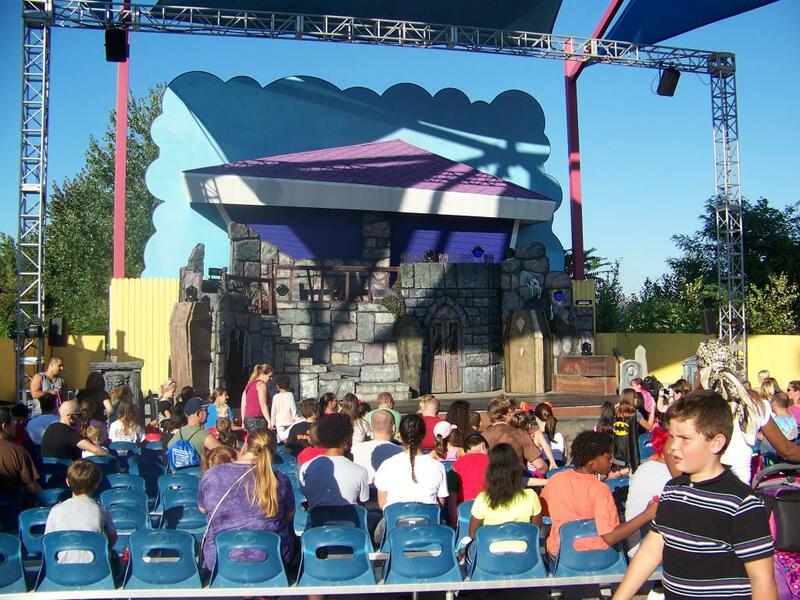 This allows the park to open that stage up to more than just children’s shows. For a park that is lacking in stage venues, this was a great choice. Getting back to the show… It sort of reminded me of a mini Dead Man’s Party but less intense. The set for this show looks excellent! The show features several monsters singing and dancing to hit songs with some parody in between. It’s sort of cheesy if you are an adult but it’s too too bad. We were there for the first public showing and it looked to be a hit. All of the seats eventually filled up and there was a crowd forming behind the seating area. When then rode Scream and Thunderbolt. None of us had ridden Thunderbolt in quite some time. For me personally, it was a huge surprise. I did not remember how much airtime it had. Plus, it was very smooth. If Cyclone was still open, I would definitely prefer Thunderbolt over it. Another cool show to see is Mort’s Used Coffins. While my group didn’t watch it, the group Josh was in did and they enjoyed it. 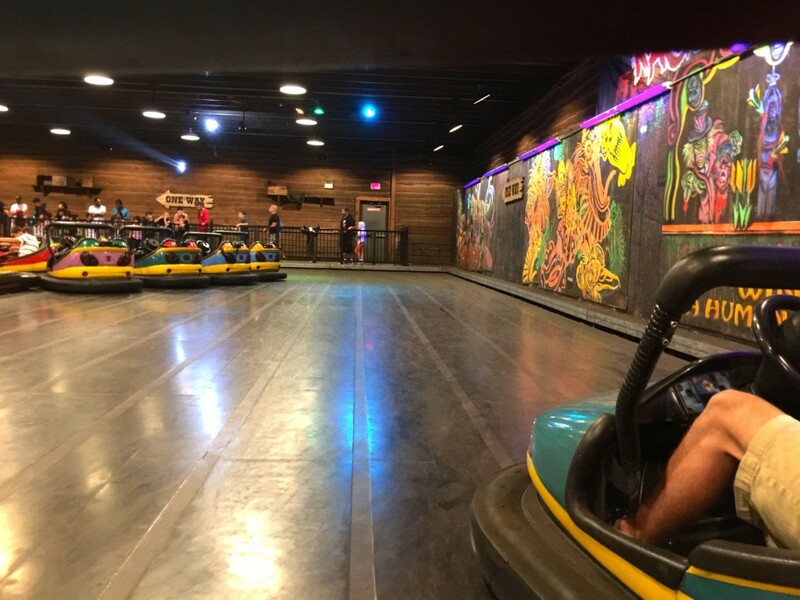 While we weren’t young enough, our awesome tour guide, Heidi, also told us about some of the other things guests can enjoy during Thrills by Day. 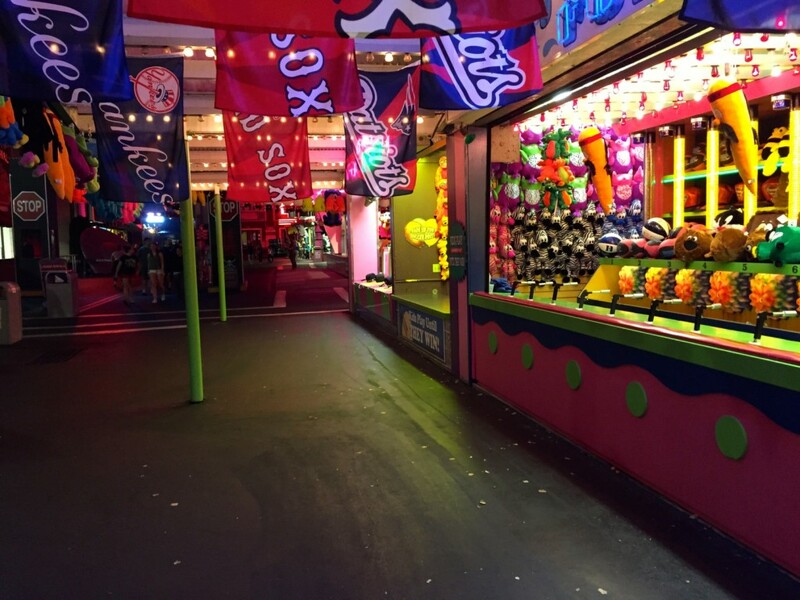 In addition to all of the attractions guests can enjoy during the summer, there are some other things exclusive to the fall season. Younger guests can go trick-or-treating in Looney Tunes Movie Town. For $1 (and all of these proceeds go to charity), kids can walk around the former Foghorn Leghorn train ride area and meet whimsical Halloween characters. Not only are there characters, but there are cool facades that the characters come out of. If anyone has young children, this will definitely be a memorable experience for them. Also in Looney Tunes Movie Town is Mayhem Mission, a ghoulish gameshow. We didn’t watch any of this (all we saw was the set on the stage), but here is the description for the show: “The lab is brewing with our Ghoulish Gameshow as brave souls are sought to bring the master plan to life. Join our Scientists for plenty of hands-on excitement and horrifying hilarity in this family show!” Sounds like it’s a fun kid’s show. 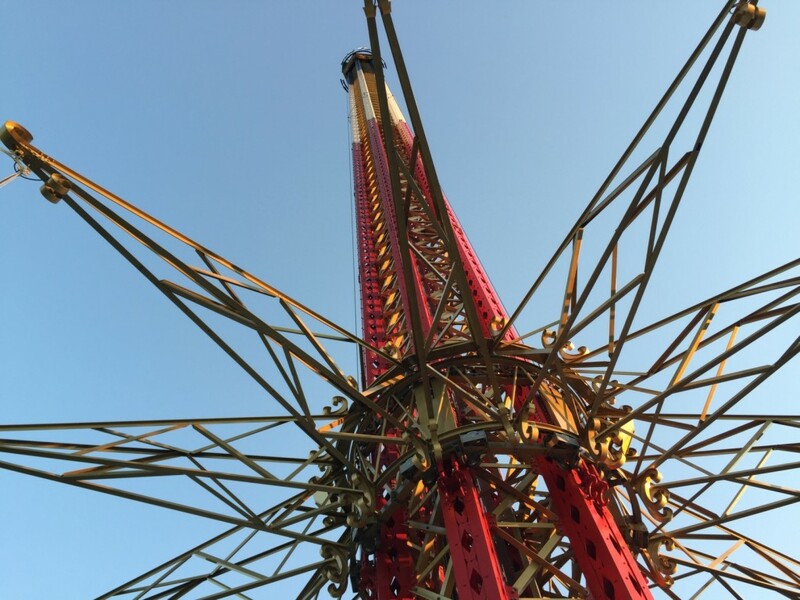 Another thing we experienced during Thrills by Day was Backwards New England SkyScreamer. 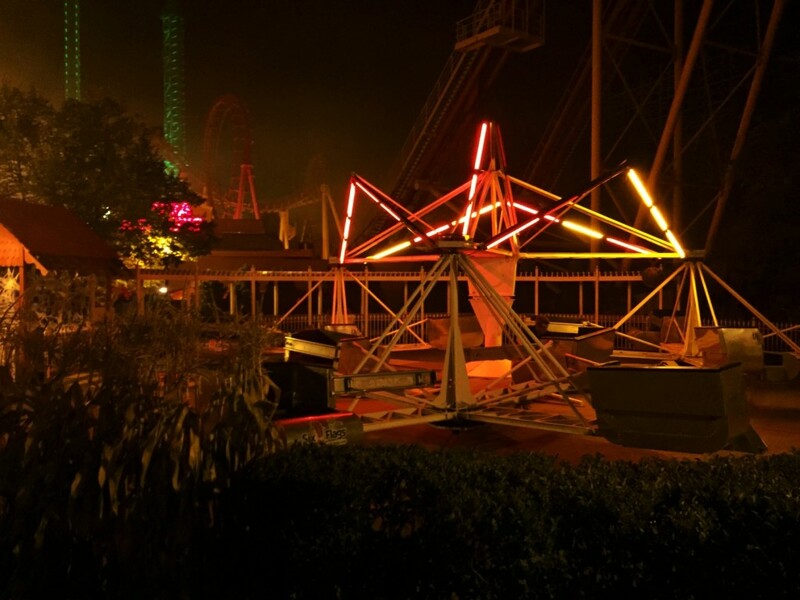 That’s right, Six Flags New England is running their newest ride in reverse for this year’s Fright Fest! I have to say, riding New England SkyScreamer in reverse was pretty cool. 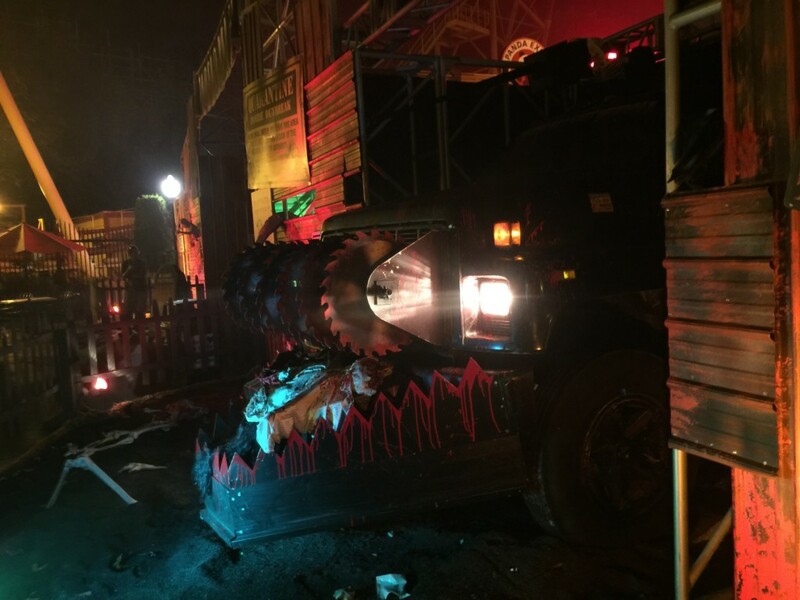 We were previously told that they would have to turn the chains around physically to get the ride to run in reverse. But this wasn’t the case. 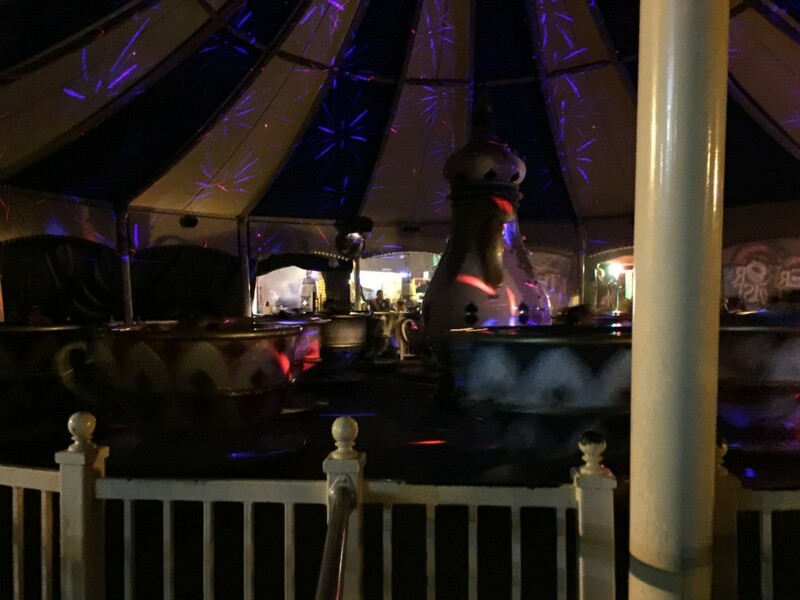 The ride carriage itself is actually spinning in the opposite direction. The reason I mention this is because even though going backwards was fun, it wasn’t as thrilling as regular New England SkyScreamer. The ride is noticeably slower and we believe this is because of the ride carriage having to spin in the opposite direction. Since it is running slower, riders don’t get that whipping sensation they normally get when it runs forwards. At this point, it was almost time to watch The Awakening. 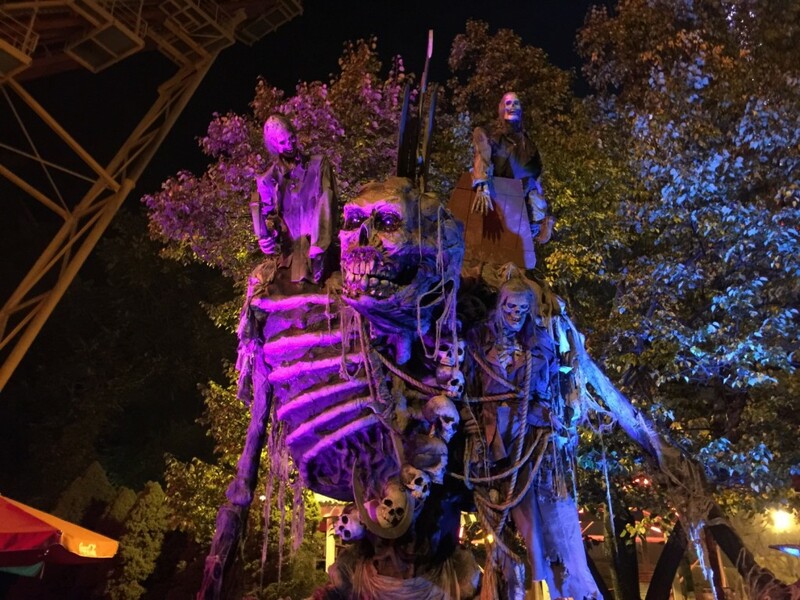 Added last year, this show serves as the transition between Thrills by Day and Fright by Night. 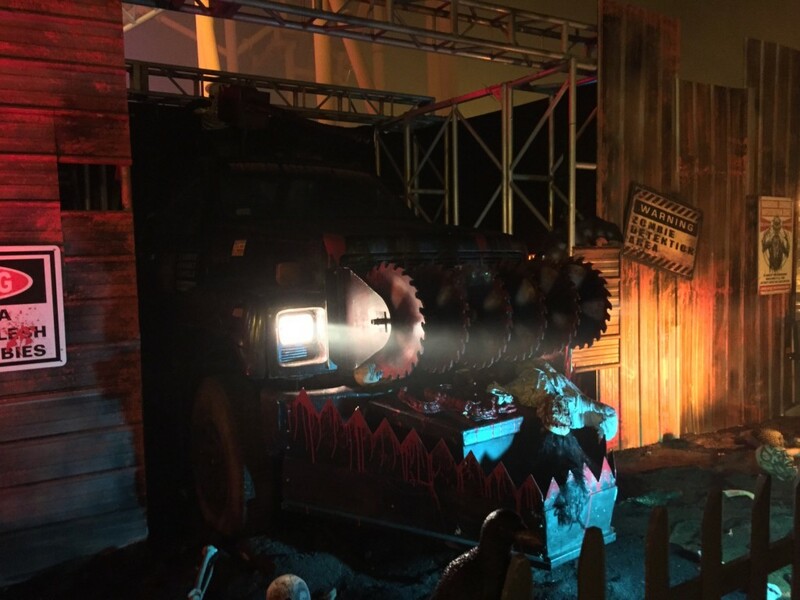 I wasn’t able to experience it last year, but now that I’ve seen it in person, I think it was one of the best decisions the Six Flags management team could’ve made to improve Fright Fest. Having a physical transition such as this was something that was desperately needed. The show is a huge hit. I don’t think I have ever seen the area in front of the Looney Tunes Emporium this packed before. The actors in the show take that to their advantage as well. I’m not going to say any more than what I have already said because everything else I say will be a spoiler. Basically, if you’re going to Six Flags New England for Fright Fest, you do not want to miss The Awakening. I also want to mention that the addition of Mayor Slayer was another brilliant decision. Having a Fright Fest icon just ties the whole event together very nicely. 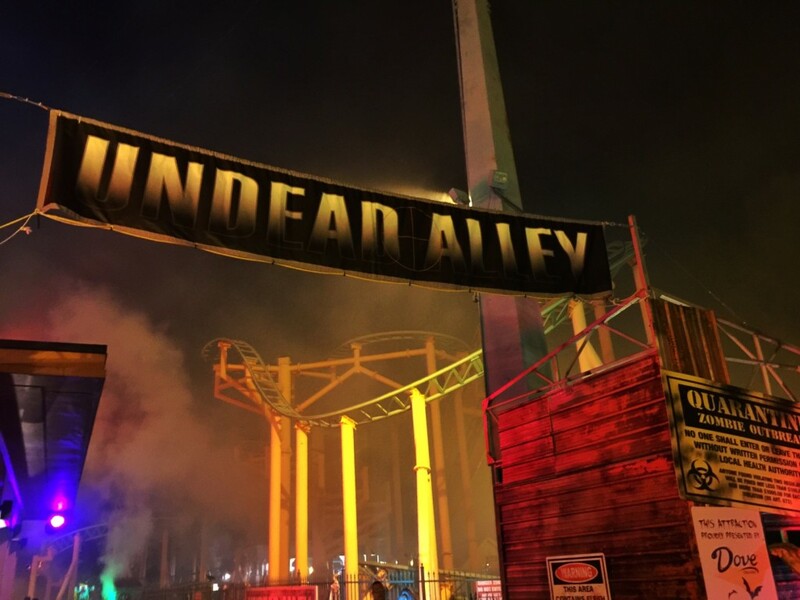 Not only is Mayor Slayer a part of transition to Fright by Night, he also is the anchor of an attraction in Undead Alley. More on that later. After The Awakening we went down to the River’s Edge Picnic Grove to eat dinner. Six Flags New England’s catering staff outdid themselves once again. We had mac and cheese with lobster, stuffed chicken, clam chowder, carved turkey, roast beef, along with several sides. Dessert was either an apple pie or pumpkin pie. Everything was excellent! We did Total Darkness first since it was directly across from where dinner was held. Only one person in our group had been through Total Darkness last year. According to that person (and judging by the several posts we had on our Facebook page last year), Total Darkness was… not that great. 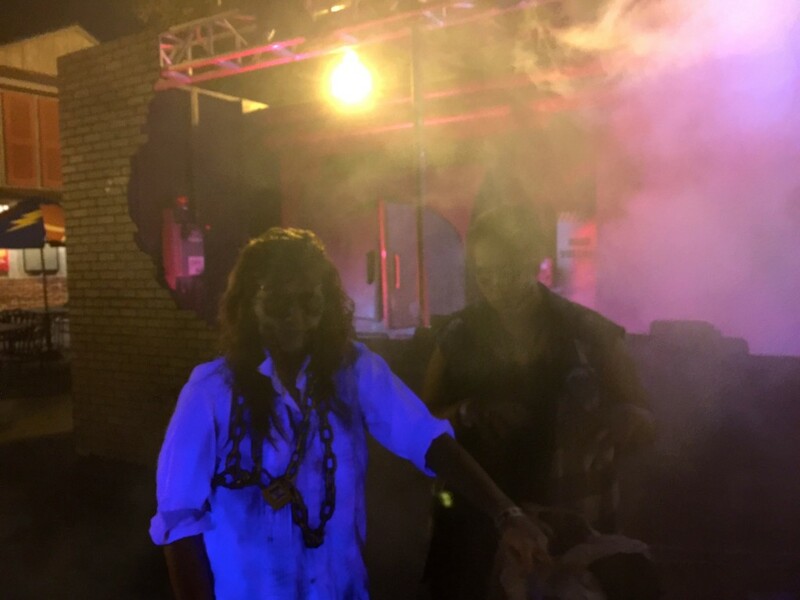 A lot of people complained that it wasn’t dark enough and that besides the idea total darkness, there was nothing else to the haunt.For these reasons, we kept our expectations to a minimum when going into the haunt. When guests are put into their grouping shoot, they are handed a rope with a glow-stick attached to the end. I assume this is to keep everyone together. We were told that some improvements were made over previous year’s version. Even though I have nothing to compare it to, I think that those improvements definitely showed. The first major change we were told about was the addition of spotlights in the grouping area of the queue. 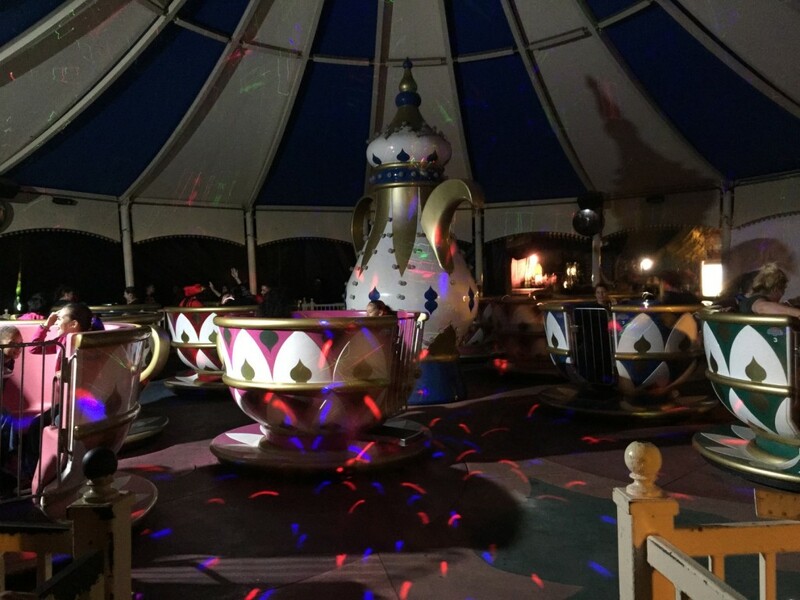 These bright spotlights shining down at guests will make it harder for the guests’ eyes to adjust to the complete darkness once inside the building. There’s another part in the haunt itself that does this same thing. I won’t spoil where in the building that is because it’s a surprise. Actually, it’s one of the few areas that scared me. My personal thoughts about Total Darkness was that it was pretty cool. It’s definitely scary, but more in the psychological sense. I do wish there were more spots where there is absolute pitch blackness. I can only recall two. The first of those total darkness areas was especially cool. I’m not going to spoil it, but the actor working in this zone did a great job. Some other improvements made from last year’s version was the addition of air cannons and drop doors. Pretty basic stuff but they get the job done. Personally, I wouldn’t wait that long to experience this. Everyone in the group expected it to be scarier and longer than it actually was. I seemed to have been the only one who enjoyed it. 2.5/5 stars. 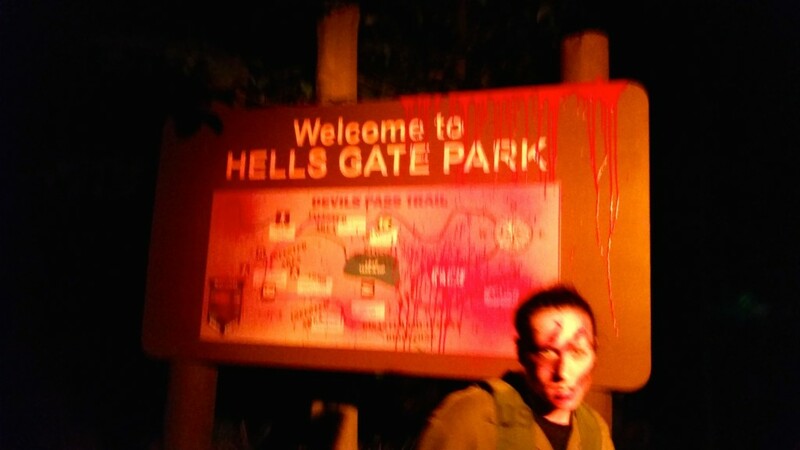 The next haunt we did was Wicked Woods. One major change to this year’s Fright Fest was the park’s decision to split Wicked Woods in half. On paper, that probably doesn’t appealing. I know I was skeptical when I first heard that change was going to occur. In practice, however, it was a great decision. Not only did it give the park the chance to refresh certain areas, it will also make the lines shorter for the other premium haunts. This new version of Wicked Woods throws guests immediately into the graveyard scene that has been there for years. From there, it’s almost like the old Wicked Woods, except different. A lot different. What’s different this year is the paths have been tightened and they are more twisty. There is a lot of new lighting features that makes everything look great. It also appeared that there was some new theming elements that weren’t there in years past. As always, the actors did a great job. In fact, there were more actors in here than ever before. The tighter pathways provide a more intimate experience with the actors, which in turn makes the scares feel more personal. I do want to mention that even though it is physically shorter, it didn’t really feel that much shorter. I think that has a lot to do with the tight and twisting pathways. 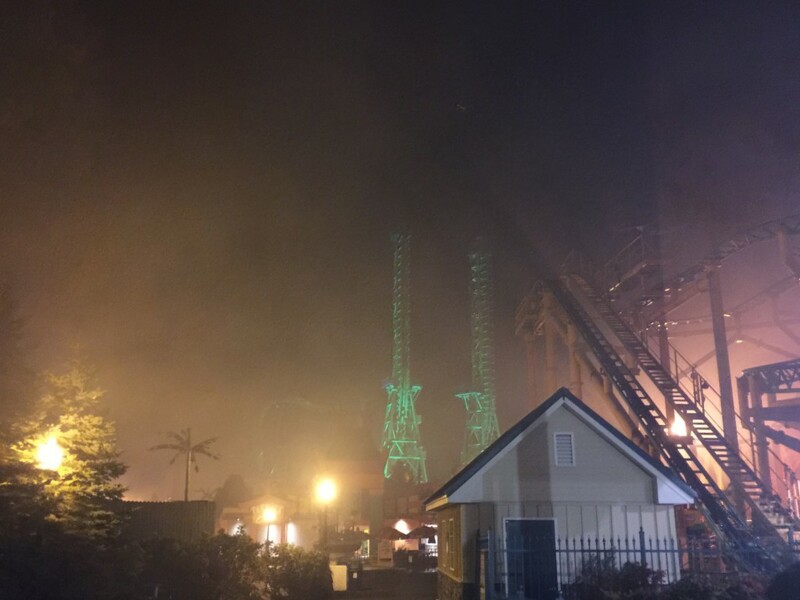 My only complaints about Wicked Woods was that the epic effect at the end of the haunt is either not being done anymore or was broken. If you have been through Wicked Woods before, you probably know what I’m talking about. It’s the end hazmat tunnel that I believe was only added a couple of years ago. We walked under the structure but the lighting effect wasn’t on. There wasn’t much fog either. Don’t know what happened there but it was a minor disappointment. The only other little complaint I have is that there was rather large area of nothingness just before the Mine Shaft scene that felt and looked odd. Something cool could definitely fill in that dead area. Even with my minor gripes, Wicked Woods got a much needed refresh that I don’t think it would’ve seen had they not split it in half. 3.5/5 stars. 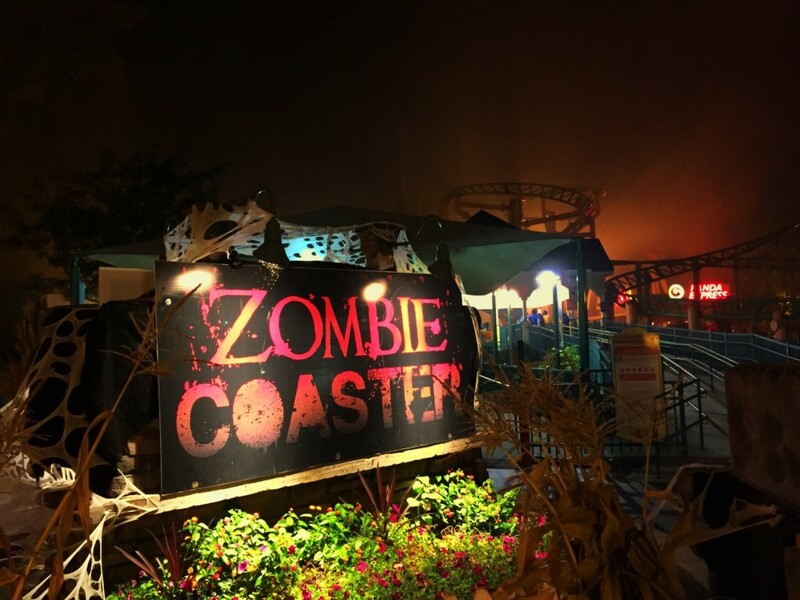 This is Six Flags New England’s newest haunt. 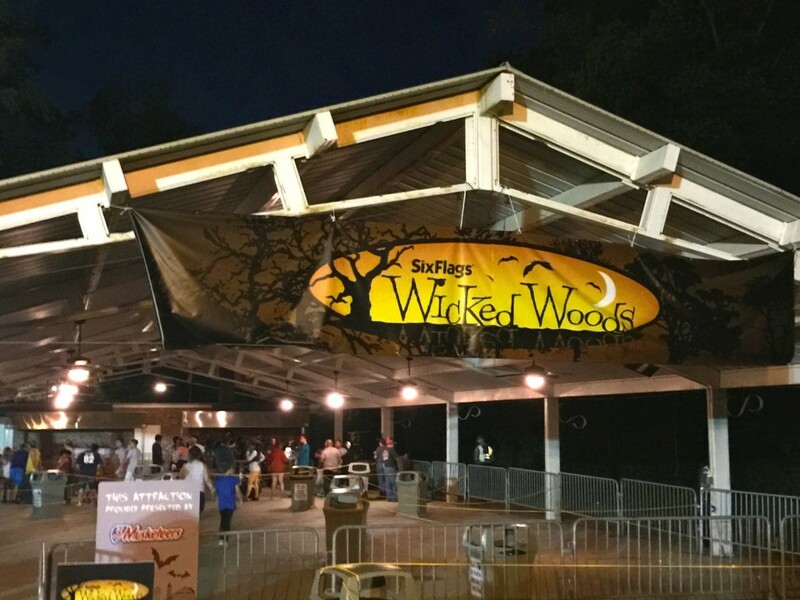 It takes over the former first half of Wicked Woods… Except it is completely different. Like even more different than the new Wicked Woods. This will be immediately noticed as soon as guests walk out of the picnic pavilion that acts as the queue. The idea behind The Aftermath: Zombie’s Revenge is that humans have been hunting zombies in Hells Gate State Park, but then the zombies started fighting back. And fight back they do. All of the sets in The Aftermath look excellent. There’s not much I can say about The Aftermath without getting into spoilers, but what I can say is that it’s one of the best haunts the park has had in a while. The only thing in the past couple of years that’s better than this was Slayer’s Lair. There are several spots in The Aftermath where I actually got scared, and I don’t normally scare easily. The Aftermath was different. I like when there is a mixture of physical scares and psychological scares (that may be why I enjoyed Total Darkness more than others in the group). There is a signature effect in the middle of the haunt that I don’t know if any other haunted attraction in New England has used. It’s both physical and psychological. In terms of other effects… The music is epic. The lightening is perfect. The actors are at the top of their game. There are areas with dense fog. There’s also one section with a fake newscast discussing the zombie plague that has broken out which I thought was very eerie and cool. Oh, and the music was epic. Grouping for this haunt also seemed to be better than the other three. Not sure what was going on but groups were being sent out with at least two and a half minutes between each other. The other haunts seemed to be only about forty seconds each. 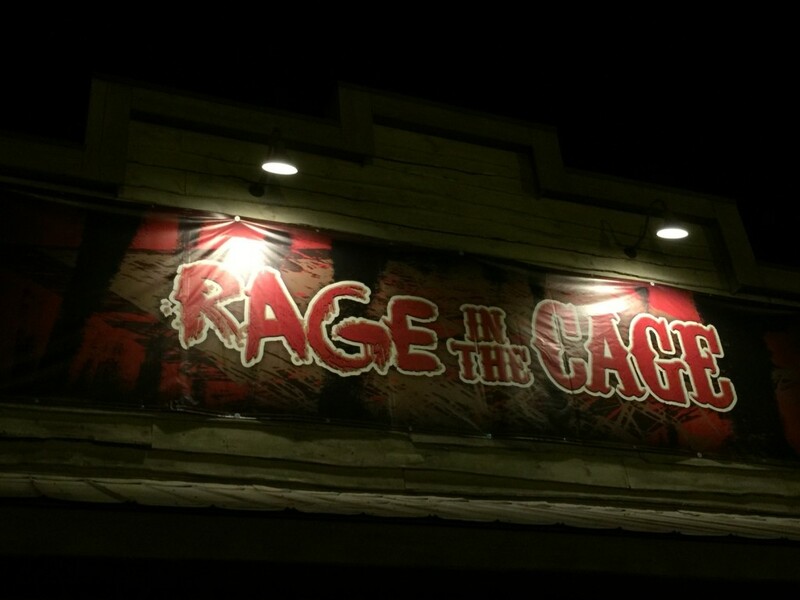 While this leads to a longer wait time, it makes the haunt experience better. For example, in Wicked Woods and Midnight Mansion, we ran into the group in front of us about halfway through. This made those attractions less scary because the actors had already done their main scare when the first group went by. With The Aftermath, however, we never ran into another group. It felt felt isolated. The only complaint I have is with The Aftermath is the ending. It looks like something cool is going to happen and then… nothing, just back into the grove. Maybe it was a timing issue with the actor at the end or something. Not sure. But it was very abrupt and extremely anticlimactic. Other than that, everything about this attraction was amazing Also, did I mention how the epic the music was? 4.5/5 stars. Before I get into the final haunt, Midnight Mansion, I have a general complaint about the atmosphere down in the River’s Edge Picnic Grove. This could’ve been a one time thing, but what was up with the Top 40 music playing down there? It completely killed the vibe while waiting in line for the three haunts. The music playing inside The Aftermath would’ve worked perfectly for the queue areas. I think the Top 40 music playing may have also contributed to the ending of Aftermath feeling rather abrupt. Update October 6, 2014: Just heard that the music was different this past weekend. 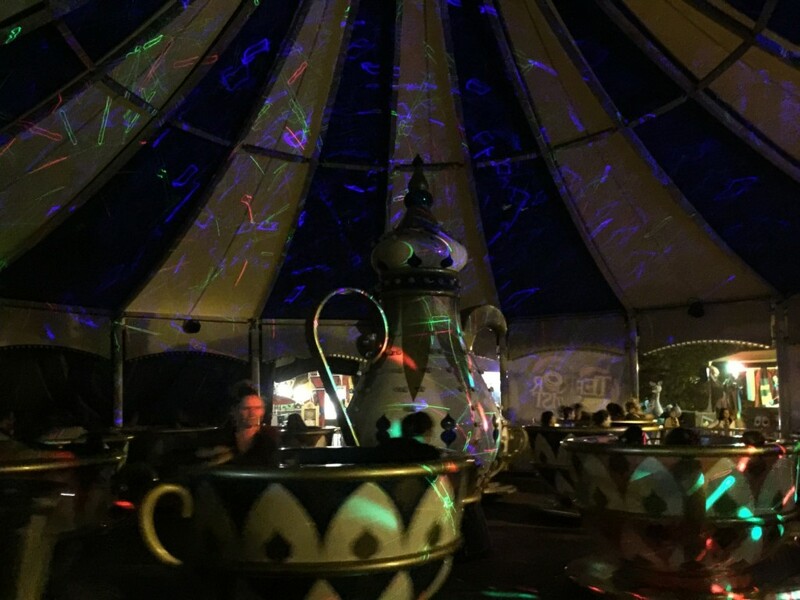 Midnight Mansion is the same attraction as every year. I actually felt like this was the weakest of the four this year, and to be honest, that’s not as bad as it sounds. 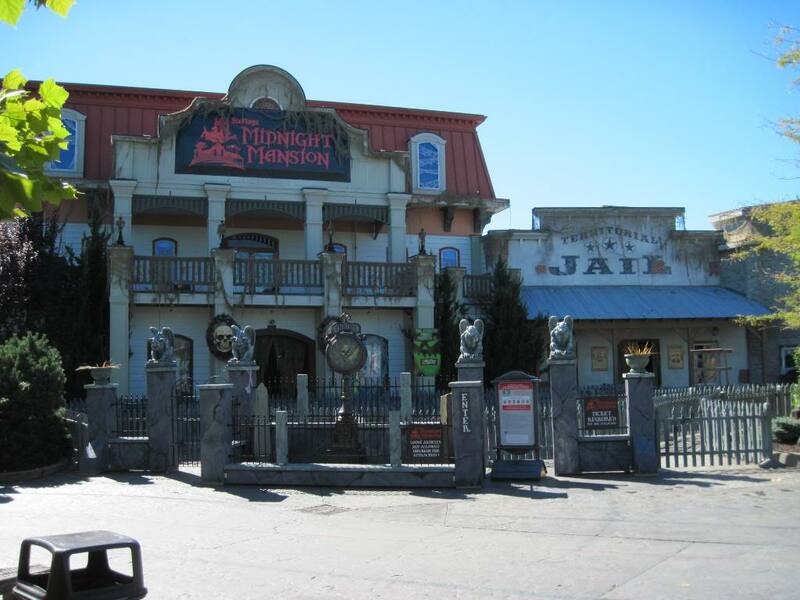 Since about 2007, Midnight Mansion has been the best haunted attraction at Six Flags New England. Slayer’s Lair took that place in 2011 and 2012. 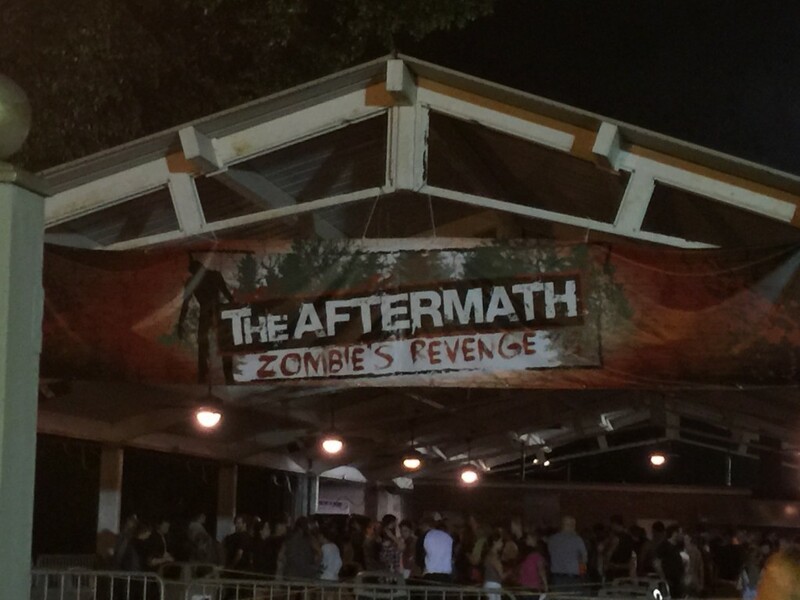 With it being this year’s weakest haunt, I think it shows how much Wicked Woods and Total Darkness improved this year, and how great The Aftermath: Zombie’s Revenge is. Now I’m not saying Midnight Mansion is bad or anything, I think it’s just getting old. Very old. The dialogue is stale and cliched. Being asked, “Are you hungry? Yes? Guess who’s on the menu?” isn’t scary anymore. Baby Jane does the same stuff every year; jumping up and down on a bed asking “Wanna play with me? !” simply isn’t scary. And no, Baby Jane. No I do not want to play with you. There are no more surprises with the door scene or anywhere else for that matter. It’s just old and stale. With the last three quarters or so of the haunt, there were no actors. Absolutely nothing. Though, we may have gone through the haunt during a shift change or something. I think it’s simply time for a change. 2/5 stars. Update October 6, 2014: I recently heard from Josh. He went through the haunt about twenty minutes after us and had a completely different experience. He said he noticed a lot more actors than usual. 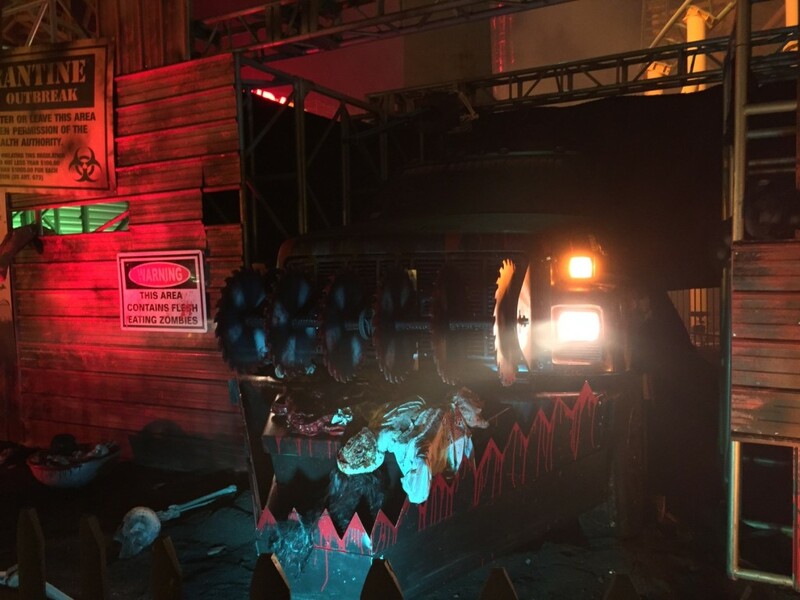 Over the past couple of years, Six Flags New England has introduced two new scare zones, Demon District in the South End and Undead Alley in the North End. 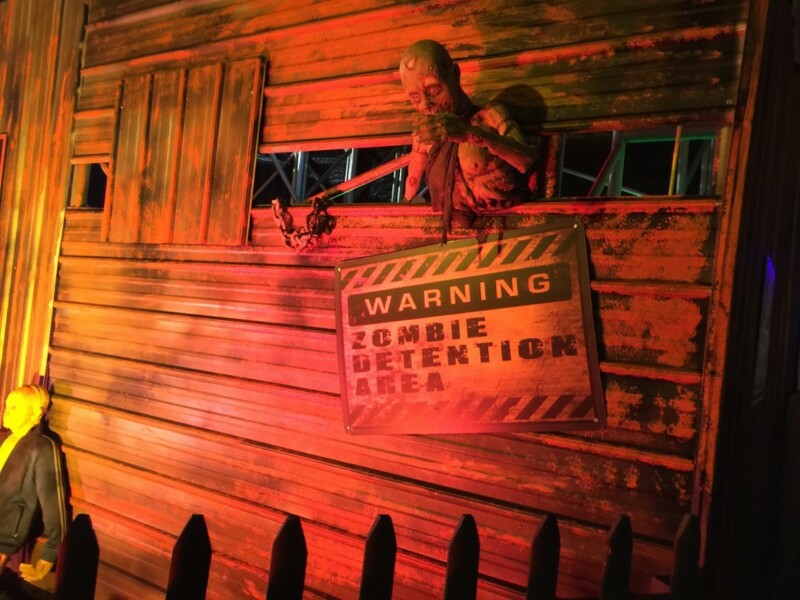 These new scare zones were desperately needed after years of only Main Street Graveyard, Tombstone TerrorTory (Crack Axel Canyon), and Area 51 (Rockville). I’m going to review the scare zones in the order of worst to best. I don’t mean to sound overly harsh here… But what’s the point of this area anymore? It is by far the worst scare zone. Usually there are never that many actors in this area and this year was no different. In fact, I didn’t see any actor in here at all. I feel like ever since Hangar 18 (a free mini walkthrough attraction with a funhouse-like spinning vortex tunnel) was destroyed by that freak snowstorm in 2011, Area 51 hasn’t been the same. Even before then it was pretty weak, but now it’s just living on borrowed time. 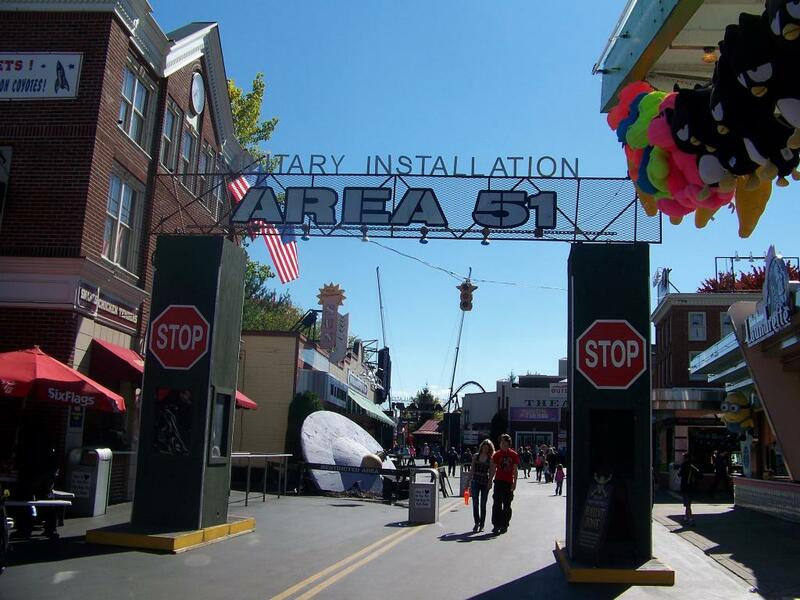 Besides some random theming scattered here and there, there isn’t that much difference between Area 51 and normal Rockville. I know these two pictures are artsy and all but doesn’t it mostly look just like Rockville? 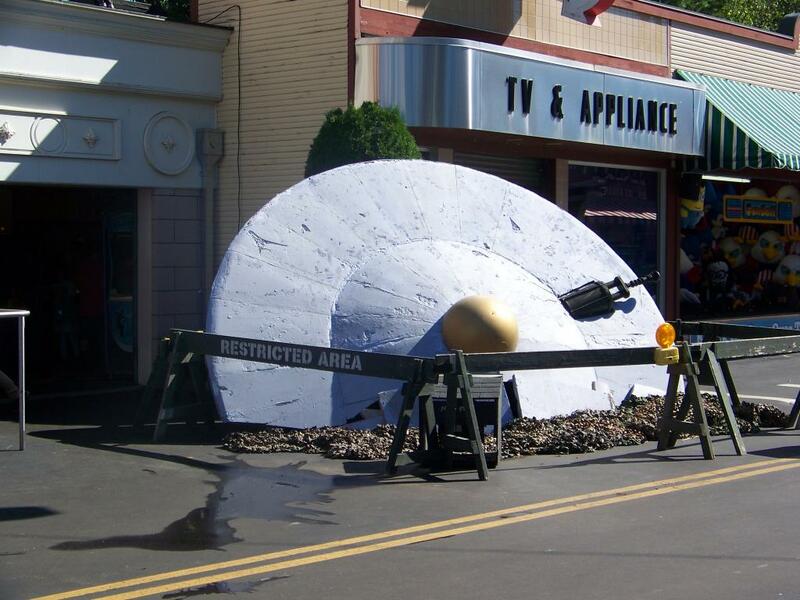 The only theming I can think of off the top of my head is the UFO that’s crashed into the ground this year (remember when it actually crashed into the building? ), a truck in the area in front of Twister, some barrels, the entrance arches, a car and snake thing (seen below), and a few aliens on the buildings. That’s it. I wouldn’t be sad to see Area 51 never come back. In fact, I feel like the minimal theming that is remaining in this area (a lot of it has disappeared or hasn’t been used to its full potential) can be repurposed for an additional haunt down in the grove. Like I said above, I didn’t see any actors here so I can’t judge the scariness. These are some pictures of some of the minimal theming. In recent years, it’s sort of turned into a Men in Black type theme. Voodoo Vortex is the Fright Fest overlay of Kontiki so I’m going to include it in this section. 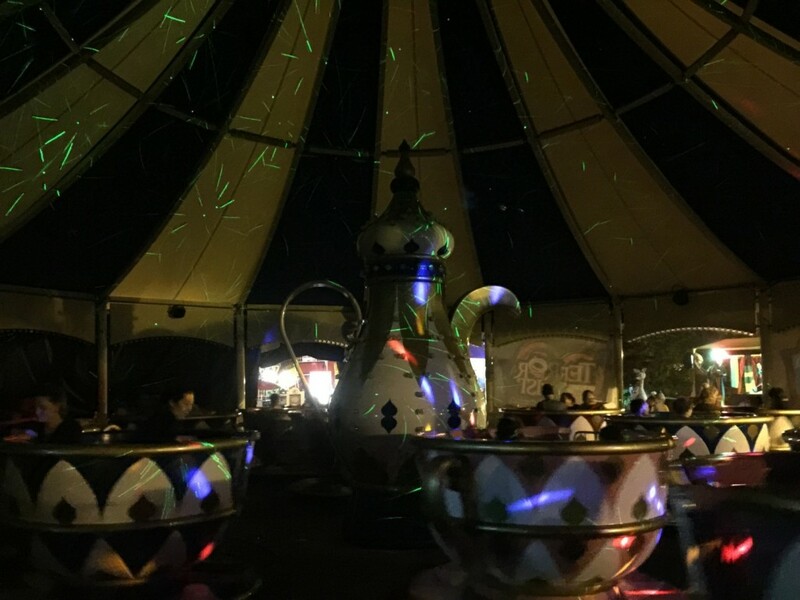 Voodoo Vortex brings in some lighting effects and music to the Kontiki experience. I actually prefer this over Terror Twist (more on that later). I just wish the music was a bit louder as it’s nearly impossible to hear the music while riding. Other than that, it’s extremely fun. Click here to see a video from 2012. Even though this is the same as every year, it hasn’t become stale like Midnight Mansion has. 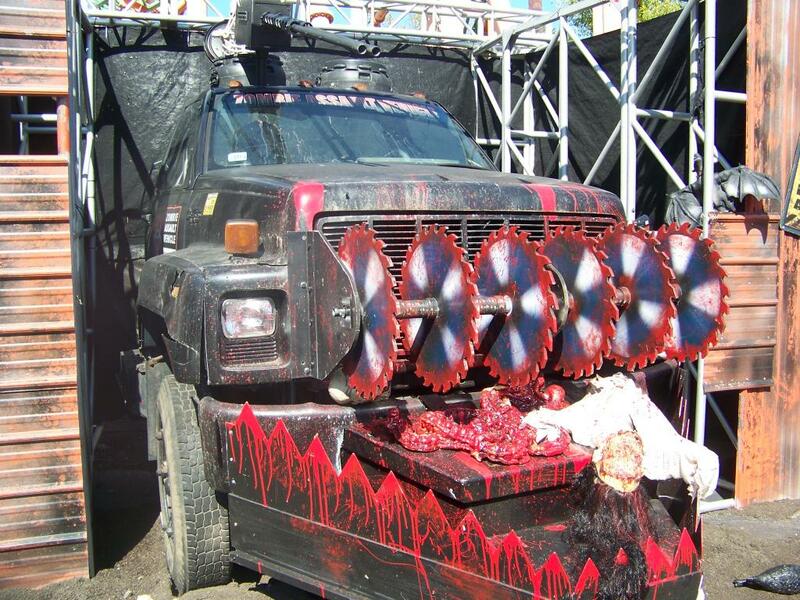 If you’ve been to Fright Fest, you know what to expect. 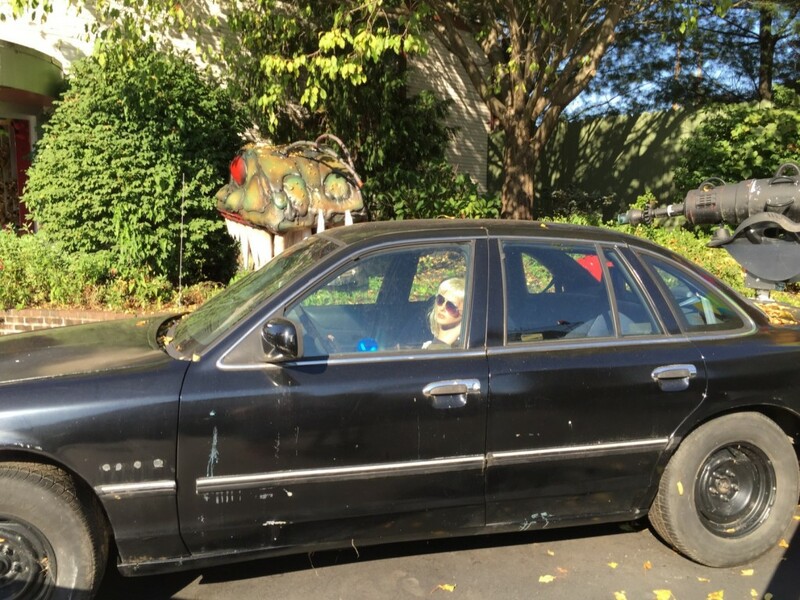 It’s a graveyard theme with dead people and scary props. The actors do a great job scaring the guests. I don’t really have much else to say about this scare zone. Some extra effects could be nice, but honestly it doesn’t really need anything different. This was added to the South End in 2012. 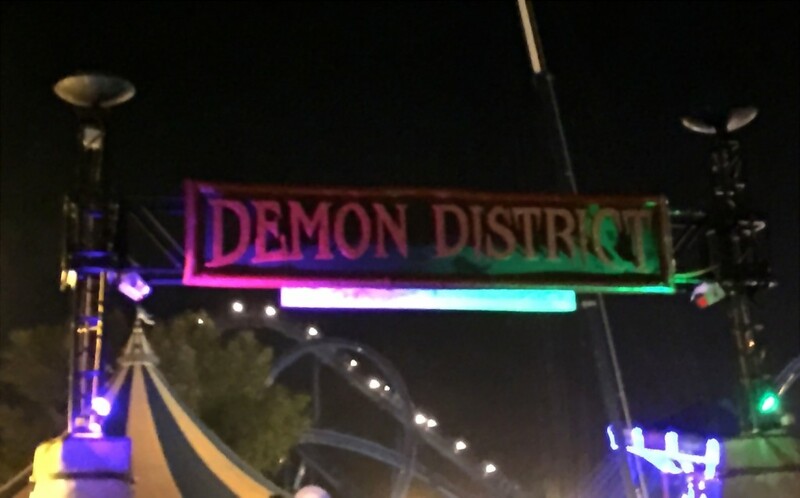 Demon District features a sort of creepy clown theme. With Demon District, the South End actually looks decent for a few months of the year. I didn’t see many actors in this area this year, though this could have been because I went through closer to closing time. That being said, the ones I did see were pretty cool. Since we were going through a few minutes before the park was closing for the night, one of the actors came up to me when we were near Mind Eraser. With a creepy voice, he asked if I could walk any faster. Then he got into this whole story about how I would be the one to die if one of the crazy clown murderers were chasing me because I was walking too slow. After that, he walked away. Or so I thought… A few minutes later he came chasing after me and scared me. Jump scares aren’t usually something that scare me easily. This was different because of the dedication to the job this actor had. I didn’t think I would be seeing him ever again, then a few minutes later he’s right behind me. Something similar happened with Spencer. While we were walking under the arch to Demon District, an actor saw us approaching. Spencer was busy taking pictures (speaking of which, a lot of these pictures in the update came from him). She came up to me and said, “Shhh…” as she pointed to Spencer. She slowly creeped up behind him and screamed as loud as she possibly could. I stood there laughing as he jumped. The actor wasn’t done though. As I was laughing she tried to scare me. These experiences with the actors were some of the best through the whole night. Tombstone TerrorTory also had the best actors anywhere in the park. There’s just something about crazy cowboys that are scary. Their outfits were great and you could tell that the outfits helped them get into character more. Tombstone TerrorTory actors make good use of shovels. I think the ground in Crack Axel Canyon helps with this even more because the shovels were sparking like crazy. Besides the deranged cowboys, there were several other characters with interesting props. I think the western theme enhances the scare zone. 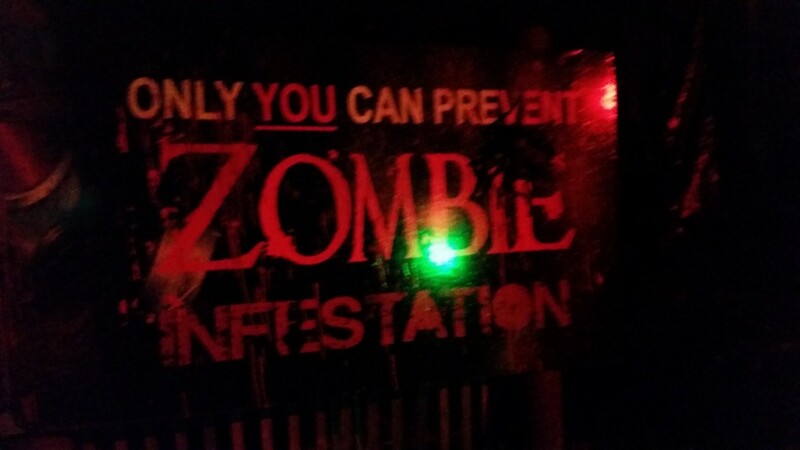 There is nothing else like it in the park, whereas there are zombies and other random dead creatures all over the park. This is what it looks like when it was loading and unloading. Then below is what it looked like while in operation. 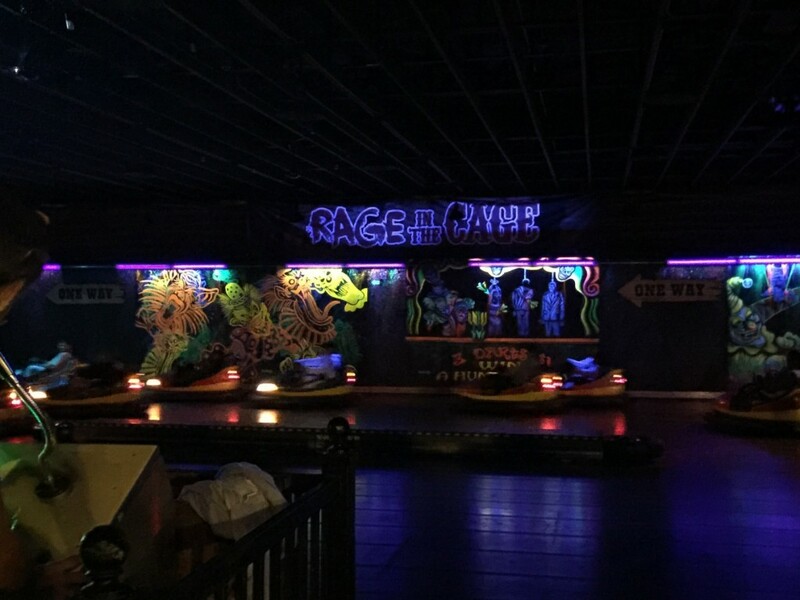 In addition to the black lights you see in the picture, there are some strobes and other cool lighting effects. I loved this section. Even though it’s the smallest, I think it’s one of the best. Undead Alley is in the North End section of the park, from Panda Express to the New England Skyway station. While there are some random bits of theming that are placed near Blizzard River’s entrance and Pandemonium, the actors mainly stay in the small portion I mentioned above. 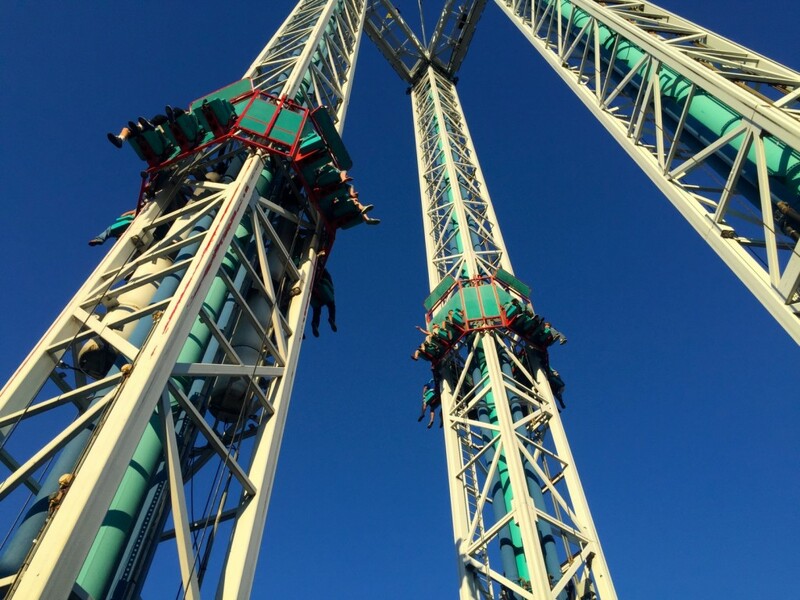 Now, if you are familiar with Six Flags New England, you might know that the section with Panda Express, Scrambler, and New England Skyway’s station is one of the most cramped areas of the park. Undead Alley takes this up another notch. There are actually bit of theming that make the already narrow path even tighter. This is where the name Undead Alley comes from. It’s very tight which leads to a more intimate experience with the actors. The theming in this scare zone is incredible. 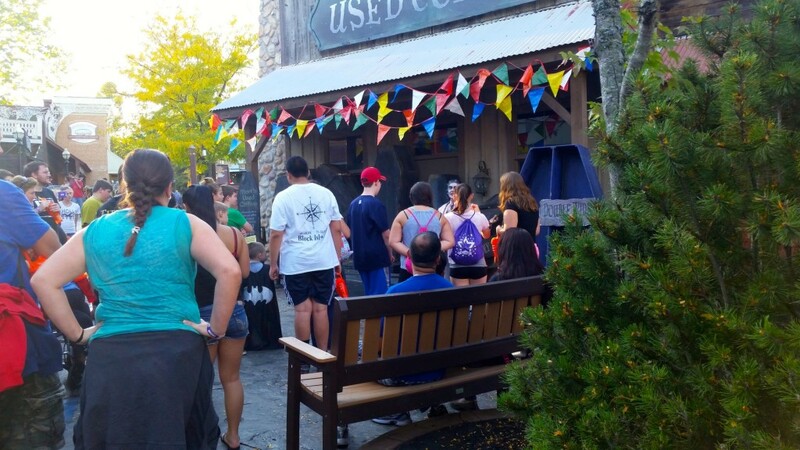 Undead Alley is definitely the biggest transformation of an area of the park for Fright Fest. Undead Alley also has the best fog machines out of any area in the park. We first noticed it while riding Backwards New England SkyScreamer. The whole area is immersed in a thick fog that the actors use to their advantage. Imagine not being able to see, then all of a sudden a person with a chainsaw comes running up to you. When I was talking about Mayor Slayer being an anchor of an attraction in Undead Alley, this is what I was referring to. Lightmosfear was added last year. What the park did was install lights at the base of each footer for Pandemonium which then makes the supports light up. Then in the area that used to hold Time Warp, they added a ton of different lighting effects. The main lighting effect is a massive Mayor Slayer head that lights up and moves around while synced to the music. 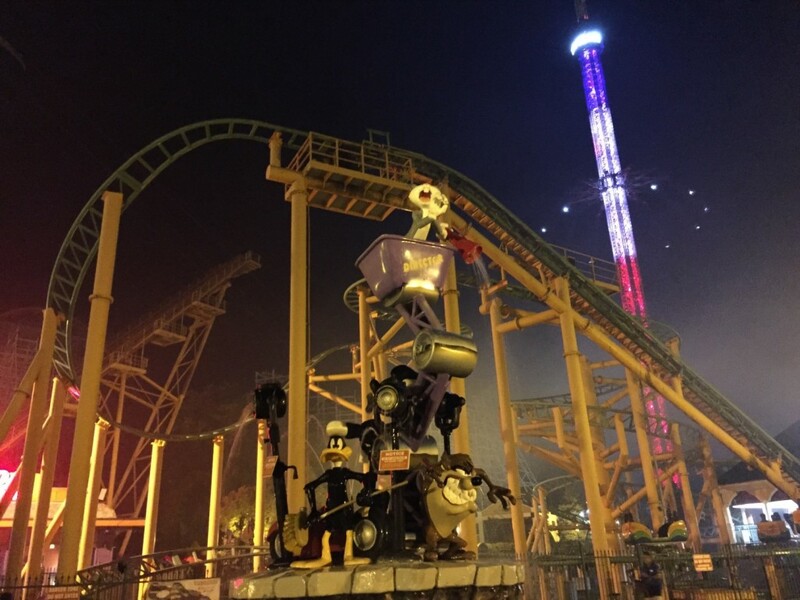 This is a really unique attraction that every guest can enjoy; they can enjoy it while riding or while walking around Zombie Coaster, aka Pandemonium. You’ll be able to see some of it in video at the end of the post. This does it for the review portion of this post. 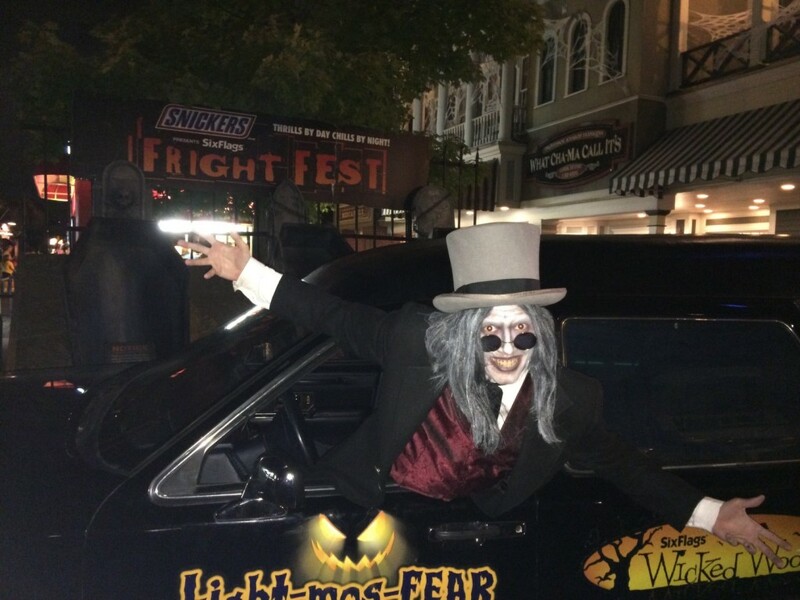 There is so much to during Fright Fest that we missed out on some things. 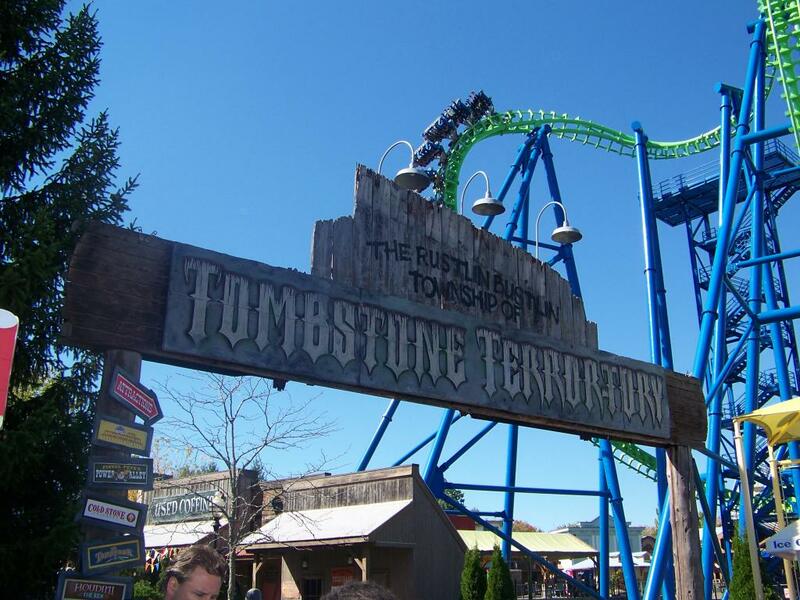 There’s Creepshow Freak in Demon District, and Verdict of Sorcery on one side of Goliath and Showdown at TombstoneTerrorTory on the other side. Click here to check out the show schedule. 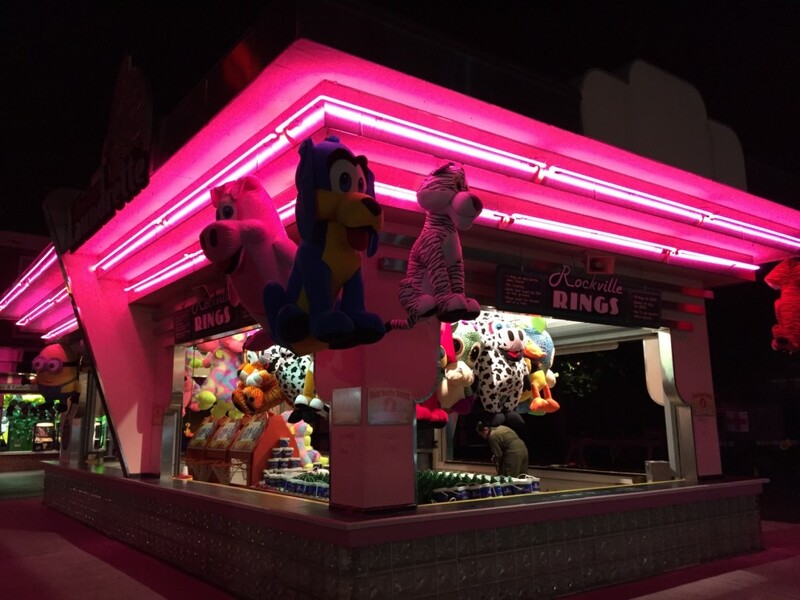 Of course there are also all of your favorite attractions in the dark. Re-entry policy now goes into effect at 5:00 pm instead of 4:30. No single tickets for the haunts this year. 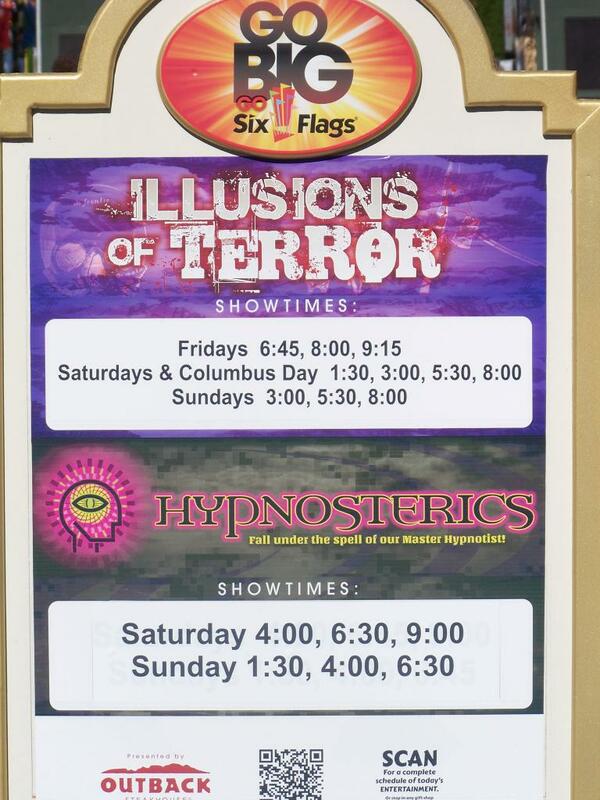 A Scream Pass gets you admission to all four premium haunts. It’s $20 without a season pass, $18 with. Or if you want to skip the lines, you can pay $35 for VIP access. If you plan on going more than once and you are a season pass holder, you can buy an unlimited Scare Pass for $35, or $55 for the VIP access. There are spider rings and No Boo necklaces for younger guests who don’t want to be scared. Lines for the premium haunts are going to get long pretty quickly. Make sure you plan accordingly. The indoor haunts (Midnight Mansion and Total Darkness) open at 4 pm. The outdoor ones open at dusk. Huge thank you to Six Flags New England and Jennifer McGrath for hosting such an awesome event! Special thanks to Heidi for being the best tour guide ever If you’ve never been to Fright Fest, this year should be the year. The park has definitely taken all of the complaints they have received over the past few years and improved on them immensely.